The opening ceremonies of the 2016 Olympics in Rio de Janeiro are just days away. But this year, fears of Zika have cast a shadow over festivities. The Zika virus is the cause of an ongoing epidemic of birth defects first noticed in Brazil in late 2015. While the virus causes no symptoms in most people, infections of pregnant women can lead to microcephaly, blindness, spontaneous abortion or stillbirth of the fetus. Now affecting nearly all Latin American and Caribbean countries, the Zika outbreak has been declared a public health emergency of international concern by the World Health Organization (WHO). As scientists and health agencies race to keep up with the epidemic, it’s no surprise that the threat of Zika during the Olympics has been in the news. Over 200 international academics, led by Canadian law and medicine professor Amir Attaran, brought considerable attention to the issue in May, signing an open letteradvocating that the Olympics should be postponed or relocated so that visitors do not import Zika virus to their home countries. For its part, the WHO has maintained that canceling the Olympics or changing the location of the games will not lessen the risk of Zika spreading internationally. Meanwhile, the U.S. Centers for Disease Control and Prevention has pointed out that the Olympics will account for less than 0.25 percent of all travel to Zika-affected countries this year. Regular travel between the U.S., the Caribbean and Latin America has led to over 1,400 imported disease cases within U.S. states this year. However, local mosquito-borne transmission has not yet been reported within the 50 states, and only 15 cases of domestic sexually transmitted cases are known to have occurred. These assurances have done little, however, to relieve public perceptions of risk in a news cycle dominated by announcements that some athletes will skip the Olympics over Zika fears. As academic scientists working at the intersection of public health, medicine, operations research and human rights, my colleagues and I have been dismayed watching how this controversy played out over the airwaves. Policymakers and travelers need evidence to make sound decisions. Questions over Zika risk at the Olympics must be addressed scientifically. To bring evidence into the Zika debate, we calculated how big a risk the virus poses for travelers visiting Rio for the Olympics as well as for the countries into which these individuals may import the virus. Our findings were published today in the Annals of Internal Medicine. The state of Rio de Janeiro, Brazil saw between 15,918 and 143,985 Zika virus infections in the year 2015, in a population of 16.5 million. The precise number of infections is uncertain because most people who get infected never show symptoms. Even among those who do, the rash, fever, headache or joint pain that typically occur may not be severe enough to warrant a visit to the clinic, meaning many cases won’t appear in health statistics. August is winter in the Southern Hemisphere. While mosquitoes can still be active this time of year, their ability to transmit infections is weak. This is one of the reasons that dengue, which is also spread by the Aedes aegypti mosquito, mostly affects Rio between March and June, when temperatures are higher and rain is more frequent. Having seen many seasons of dengue transmission, we’d expect the risk of acquiring Zika from a mosquito to go down about 60 percent in August relative to the annual average. Accounting for these factors, we estimate that between 6 and 80 infections will occur among the 350,000 to 500,000 athletes, delegates, spectators and vendors descending on Rio for the Olympics. Since only one to 16 of these individuals would be expected to show symptoms, we are unlikely to hear about many reported Zika cases among travelers. What about the risk to other countries? Because most people clear Zika virus from their blood in less than 10 days, many travelers who become infected in Brazil are likely to be free of the virus before or shortly after returning home. Accounting for this rate of clearing the virus, we anticipate only 3 to 37 travelers – roughly half those who become infected in Brazil – importing Zika virus to their home countries. Based on the breakdown of travelers who visited Brazil for the 2014 FIFA World Cup, over half the visitors will likely return to U.S. states, Canada, Oceania and temperate European and Asian countries, where the risk of local mosquito-borne transmission is low. A further 30 percent of travelers will be going back to Latin American countries where transmission is already established. This leaves under 20 percent of the 3 to 37 infected travelers at risk of introducing Zika to African, Asian and Middle-East countries where we worry about the virus taking hold. In fact, the projected delegation of athletes and travelers from Chad, Djibouti, Eritrea and Yemen – the only four countries where the CDC projects the Olympics pose a unique threat of Zika introduction – amounts to 76 travelers. Based on our calculations, a visitor’s chance of becoming infected with Zika at the Olympics and then importing the virus to his or her home country is low. Our outcomes support the position of the WHO that canceling the Olympics, or relocating the games, is not going to alter the international spread of Zika. In a world connected by travel and migration, opportunities for the virus to cross borders extend far beyond sporting events. 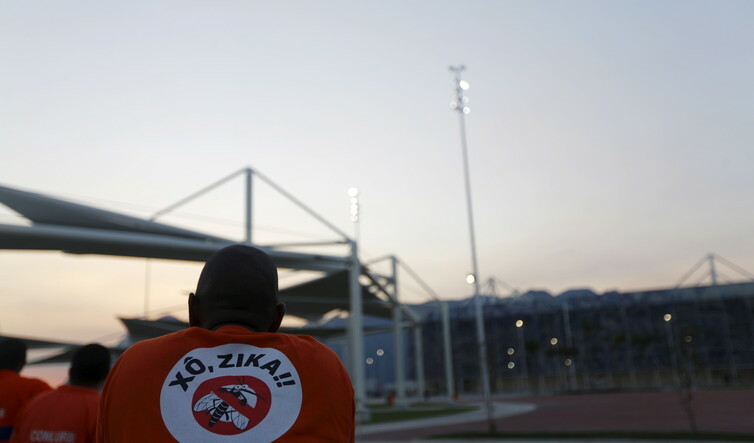 The controversy over the Olympics should not distract us from the global threat Zika poses. But we should keep fears about the Olympics in perspective. The domestic chaos over Ebola in 2014 is all it takes to remind us what happens when our reactions are guided by fear, rather than by evidence. As West Africa reeled under its epidemic, U.S. governors forcibly quarantined travelers from West Africa – even those who had not been exposed to Ebola cases – against the advice of public health experts. Students and teachers were barred from entering schools after traveling to countries like South Africa and Kenya, thousands of miles from the epidemic. At best, these reactionary responses to epidemics are costly and counterproductive. At worst, they stigmatize affected countries and their populations.